Fernando Forestieri praised the team spirit in this Sheffield Wednesday side after he capped off his comeback with a superb goal in the Owls’ 4-1 win over Preston. The forward came off the bench with 12 minutes to go and rounded off a stunning second half performance by Jos Luhukay’s side, with a well-struck free kick in injury time. Lucas Joao had earlier also been sprung from among the substitutes to help Wednesday in front, laying on Atdhe Nuhiu to open the scoring then doubling the lead with a fabulous looping header. Nuhiu curled in an incredible third from the corner of the penalty area to notch up his second brace in successive games before Forestieri’s goal sealed a hugely impressive win against play-off hopefuls Preston. While Hillsborough hailed the return of the mercurial Argentinian, Forestieri himself was paying tribute to the team as they look to add a strong finish to what has been a hugely disappointing season. “We are fighting together and we suffer together, this is our team,” said Forestieri, who was making his first appearance since the League Cup defeat at Bolton in August. “I am very happy for the group and for the coach because he needed a good win like that, it’s good for him, the players and the club. 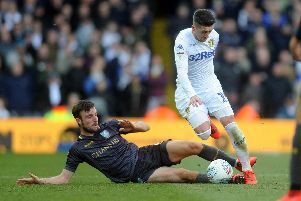 Forestieri has spent almost all of this season recovering from a surgery to his knee but made an immediate impact as Wednesday secured a second win in a row for only the second time this season, having beaten Leeds United before the international break. “I am very happy because I feel good and we won and this is important,” added Forestieri. “I needed to do a long warm up so I was ready, then the manager called me over and I was very excited to get on the pitch!